China Newswire has been operating since 2000. Even before social media was an oft-used term, we were sending press releases and content marketing materials to online media in the Greater China area. Chinese consumers and businesses are buying and selling on the Internet, and gaining fantastic online visibility inside China is the key to maximizing investments. 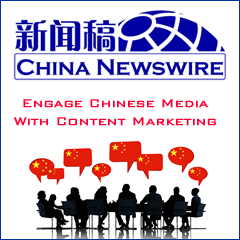 China Newswire works with a network of influential news and media websites in China to push your corporate message in front of important decision makers. Create a content marketing message, write a great press release, or submit your company\'s next promotion, and China Newswire both distributes your message and and then monitors the impact.